Welcome to a gloriously plush gaming site that is Moon Games. Enjoy over 200 out of this world games, fabulous bonuses and a star-studded theme. Welcome aboard. Yes, you can play over 200 online games with no downloads required whatsoever. 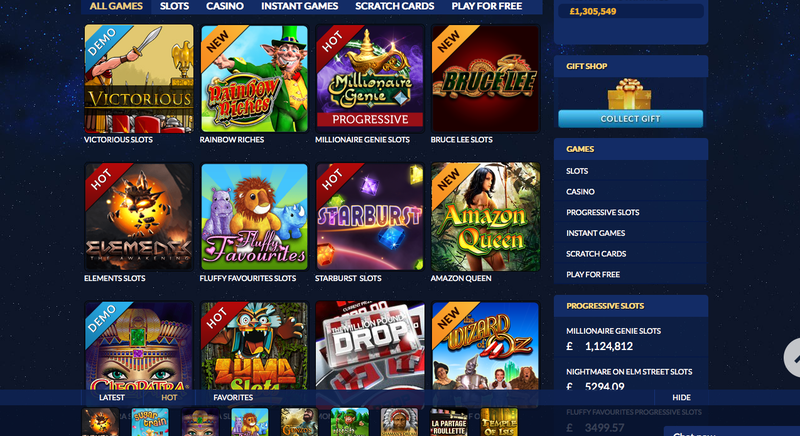 Casino games, slots, progressives, instant wins and scratchcards are on offer to tempt you. Check out the eye-watering jackpots on offer from the likes of Millionaire Genie. Nothing to download thanks to the Dragonfish software. Accepted payment methods include: Paypal, Paysafecard, Neteller, Mastercard, Maestro, Visa, Visa Electron, Ukash, Delta and Entropay. Suitable rules, policies and technical measures have been put in place to safeguard all players sensitive information. Moon Games is a very stylish website indeed, featuring a theme set in a beautiful starry galaxy far, far away. don’t panic, you won’t have to travel far to get a slice of the action, you just register and hey presto - instant astronomical gaming action. Now, there’s so many games for you to play, you may find yourself stuck for what to play first. The good news is that you can test the games for free before playing for real. Moon Games is extremely easy to navigate with the aid of tabs and useful links. So, will you be their next big winner? Join today and you just may be. Get a 100% bonus up to £500 on your first 3 deposits. Every £10 played earns you a spin in the bonus wheel, where you could win up to a massive 1000% bonus. Refer a friend and a loyalty scheme are present. Yes, Loyalty scheme at Moon Games- collect and earn points to get free chips. Claim your bonus in the Moon gift shop.